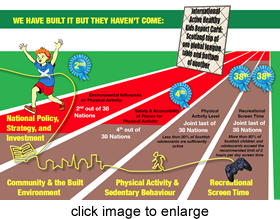 To develop and launch the first ‘Active Healthy Kids Scotland Report Card’, on 22nd October 2013. To identify a small group of individuals and organisations to help sustain the production of future cards. You can provide comments anonymously but it would be helpful to us if you provide your name, and contact email; we will publish the names of all the stakeholders who have commented in the Longform of the Scottish Report Card in October 2013. The feedback section below consists of 8 sections, and has an open section for any other comments at the end.